Tourists at Longhorn Cavern climb down steps built by the Civilian Conservation Corps. The park is named for Longhorn Cavern, a limestone cave formed by the cutting action of an underground river that receded thousands of years ago. Before the cave became a tourist attraction, it was used over the years by Indians, Confederate soldiers and outlaws, including outlaw Sam Bass. In the 1920s, during the prohibition period, the cavern was used by Burnet County residents as a speakeasy. Performing musicians would entertain through the night. The popular spot was known as Sherrard's Cave before it was dedicated as Longhorn Cavern State Park in November 1933. From 1934 to 1942, Company 854 of the Civilian Conservation Corps constructed Texas Park Road 4, residences, pavilions and an observation tower in the National Park Service Rustic architectural style. They also explored the cavern and made it accessible by removing some 2.5 tons of silt, debris, and guano and building stairs and walkways both into and inside the cavern. In 2006, Steven Kurtz, curator of Longhorn Cavern State Park, re-introduced chamber music to the cave with the creation of the Simple Sounds concert series. The return of chamber music was featured on an episode of Bob Phillips' syndicated television series Texas Country Reporter, with Kaye Barlow as the travel guide. Not until February 14, 2008, did dancers return to the cave floor when local Burnet County band Redneck Jedi performed. On April 4, 2008, Redneck Jedi returned to the cave and recorded their fifth album, Unplugged and Underground, the first such recording inside the cave. In 2008, Fantastic Fest hosted an after party for the premiere of City of Ember. In 2012, the cavern tour area received a new lighting system. The former administration building built by the Civilian Conservation Corps. The grand staircase leading to the cavern entrance was built by the Civilian Conservation Corps. ^ Longhorn Cavern State Park History. Texas Parks and Wildlife Department. Retrieved August 9, 2014. ^ a b "A Cave with a Past". TPW magazine. December 2004. Retrieved 2012-11-06. ^ Steely, James Wright. Parks for Texas: Enduring Landscapes of the New Deal. Austin: University of Texas, 1999. Print. 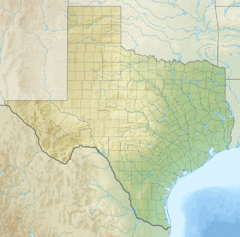 ^ The Look of Nature: Designing Texas State Parks During the Great Depression. Texas Parks and Wildlife Department. Retrieved August 9, 2014. ^ "Caverns offers concert series". Burnet Bulletin, November 19, 2008, p. 22a. ^ "Redneck Jedi to kick off". Gonzales Inquirer. Retrieved August 9, 2014. ^ "Longhorn Cavern State Park". Longhorncaverns.com. Retrieved 2012-11-06. ^ "Longhorn Cavern State Park debuts new lighting system". Austin: KVUE. 2012-07-20. Retrieved 2012-11-06. Wikimedia Commons has media related to Longhorn Cavern. This page was last edited on 30 March 2019, at 15:31 (UTC).